The Adventure includes little bit of .... Trekking, Rock Climbing, Exploring Cave Temple, Temple at Summit of Fort, Enjoying Fantastic View of Landscape, Nice Weather and Exploring of the fort..
Altitude: 2100 Feet above mean sea level. Trek Category: Moderate to Difficult. Best Season: Best season is Monsoon and Winter; (Mid June till Mid March). Who is for? Individuals or groups or corporate interested in moderate to difficult trek with few climbing challengs..
Breakfast, 2 Bottled Water, Evening Tea and Snack; + Share Cab expenses from Dasturi Naka to Neral Station. 7:45 am - Reporting time; Place "Neral Station (Reach by Central Railway Mumbai, Local Trail)"
Track-pant; Leggings; Trekking Pants or Shorts with football stockings. 2 to 3 liters of water per head in water-bottles or hydration bags. All items packed and kept in a proper backpack or Haversack. More Good to know on outdoor checklist. 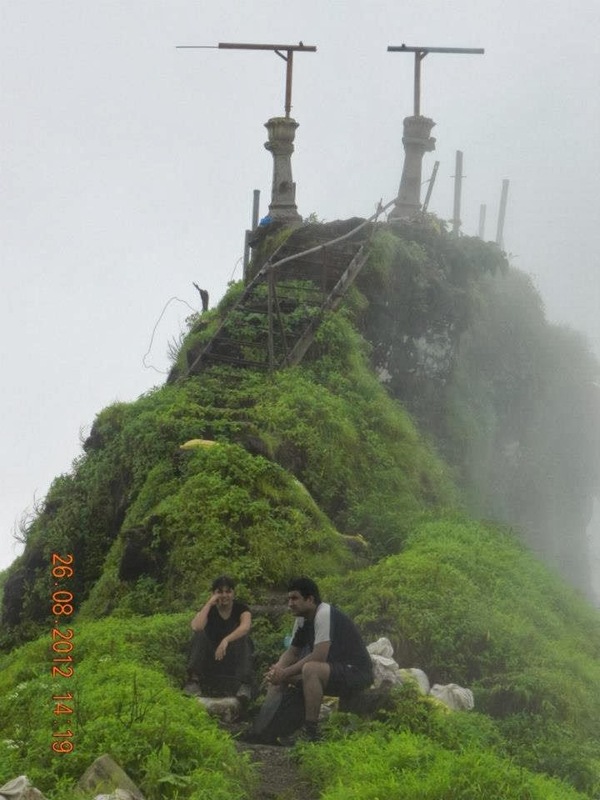 This fort is not heard by many until few years back but recently is getting more and more popular with trekkers. It’s a small fort near the ranges of Matheran (the famous hill station in Maharashtra). It is situated on northeast side of Panvel, on Mumbai-Pune road, at a distance of 3-4 km on west side of Neral. 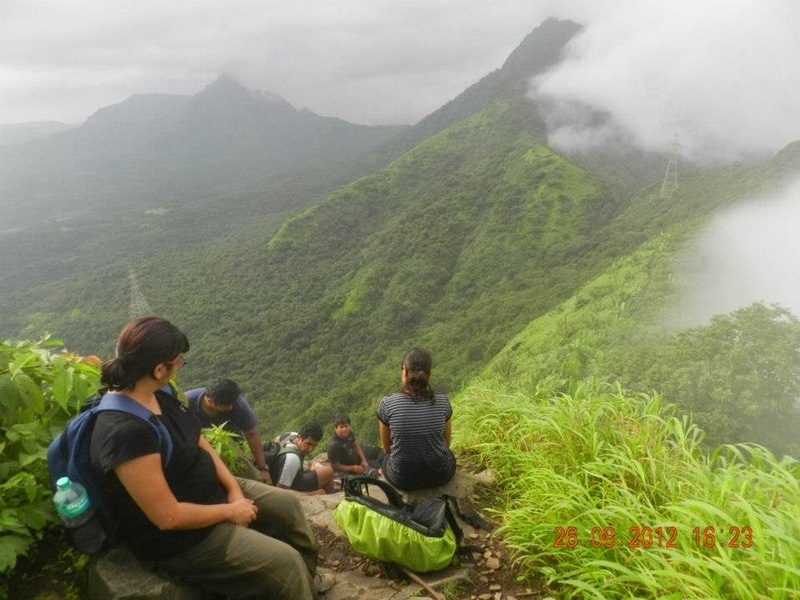 This is a one-day trek and also one of the most enchanting trek in Monsoon. It is also known as Vikatgad. The forts and hills in and around Peb Fort are Nakhind, Chanderi, Mahasmal. Prabalgad is another fort opposite this small fort. 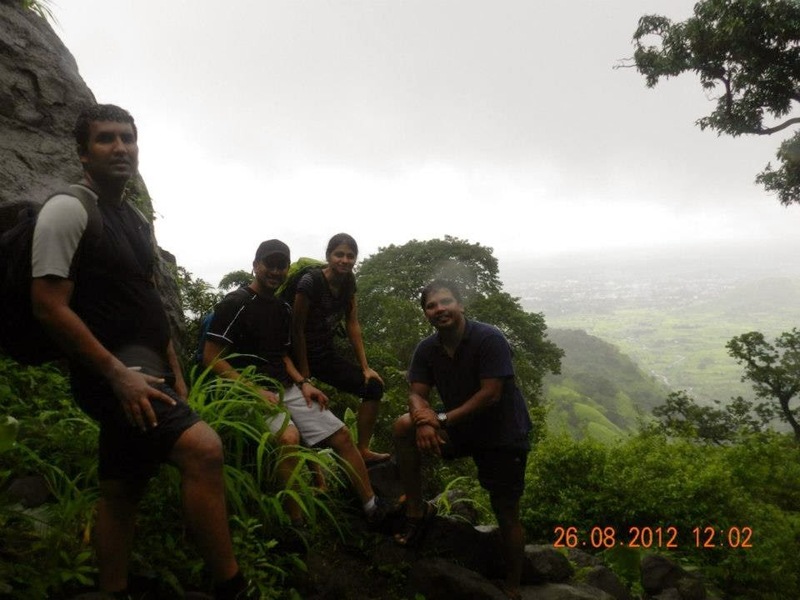 Peb fort overlooks the Konkan region and also is approachable from Pune. So Chatrapati Shivaji must have given a thought before building this strategic fort. The fort is at a height of 460 Mts. Above sea level. I jumped on my feet even before the first Decibel of my 3:30 wakeup alarm was completed. The clock gave me signal to start off a long awaited adventure; I was joined by Jyoti, Sameer, Rupa and Mithali at Andheri Station. We boarded the train for Santacruz station accompanied by hoards of crowd rushing to the starting point of Marathon race. I confirmed the attendance of Mohanty, Nimesh and Uma who were reaching kurla station along with a few more people. We had missed the 5:30 am train to Karjat and We boarded the next train was scheduled at 6:09 am. Nimesh waited back for the late comers, to catch the next train. The morning looked as fresh as a due at 20 degree centigrade, my instinct told me that nothing could go wrong today as we approached Neral Station to join Melky, Sidharth, Karishma and Harsh at the railway INN. We had introduction secession with crisp biscuits and steaming tea to complete the warm environment. With clock striking 8:45 am, we had 15 pairs of legs taking the North Direction along the western side of railway track. We went along the road which goes to Matheran until we came to the cross road between the highway and one mud road going straight, we took the mud road going in the west direction. The mud road was lined on one side by palm trees as we approached the poultry farm as mentioned in the Map. We hired 2 tiny guides with single digit age from the last Hamlet on the way to Peb Fort. With the sun basking on our back as we started to the climb up the mountain, which got steeper as we progressed to our next mile stone the Power Cables towers and then towards the KOL. At the saddle of KOL we could see both sides of the mountain, on one side we could see the Haji Malang, Sanshi and the Konkan plains and on the other side we saw the railway line and the route from where we started our trek. We climbed over the narrow hump of the mountain with 360 degree view of valleys on both sides, the view was creating some kind of optical illusion. We climbed the mountain gradually till we came to our next landmark the white rock which we had to do a miniature rock climbing holding a few smooth holds and a perform a two step chimney climb. With team effort we overcame this obstacle. As we climbed ahead the path forked ahead into two, we took the one on the western side on the mountain and headed south. Now we had a rock wall on one side and a deep valley on one side, as we walked along the narrow path. The pleasant breeze cheered us to march along against the Sun who seemed to follow from one side of the mountain to the other. At around 1:15 pm we finally reached our first major halt at the Cave shelter near Peb fort. 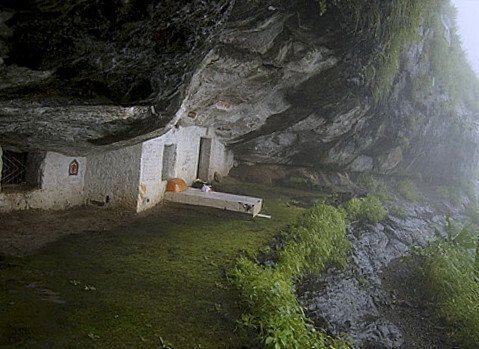 The Sadhus had converted the caves into a kind of semi luxury hotel considering the circumstances. They had a nice hammock hanging on one of the overhanging rocks which a 5 star view of the valley, nice china wear wash basin and to finish it up a toilet made of canes from karvi shrub with a drain pipe. Great going! We put our feet up as few practiced caving in the three narrow caves which led to a meditation chamber in side; it reminded me of Saddam’s hiding spider hole. But this one had a good meditation facility. After we confirming our direction towards with a Pune party who was camping at the Cave shelter we proceeded towards Matheran. We progressed along the narrow path we were reminded by a stunning whooshing alarm caused by a flock of hiding Night Jars (a species of nocturnal birds) that it was time to halt for lunch, we stopped at beautiful semi circular carved mountain rock, with an enchanting view. Soon there was noise like on any Railway Junction for eatables, Spice Theplas, Saucy Baked Beans, Pav Bhaji, Alu Bhaji and what not, Finally Jalabiâs to wash it down. The appetite was quenched and we proceeded on the adventure, now the trail really got very narrow as we turned toward south east along the mountain curve, the grass here was dry and had a unique golden colour reminded me of Phantomâ€™s Golden beach. The only unromantic part about this grass was that it was highly slippery and we had no choice to walk on it with the rocky wall on one side and deep valley on the other. The silent was pin drop as we approached the KOL between Peb Fort and Panorama Point. We thought of taking a break for two purposes, 1) to catch up with our nerves and 2) to make a crucial decision to progress on the every growing difficult trail. First we confirmed our location seeing the map, the sun the land marks. The next thing we started was a management brainstorming about our decision to go ahead, we decided to send 3 scouts ahead to understand the degree of difficulty. Nimesh, myself and Ajay went ahead to scout, Nimesh was way ahead gave a feedback that the route was not as-difficult-as it looked and not impossible. hours backwards or 1 hour of tough route ahead. The route backward was also not so easy. Suddenly out of nowhere the famous Mini train of Matheran came whistling and chug chugging a song so sweet, that Mere Sapno Ki Rani might seem shadowed in its melody. The site of train and its song worked like magic potion; the decision made and unanimous as the train bade us good-bye just few meters above us, we were going in the direction of Panaroma Point. Cheers and C U soon on more adventures..